The 2017 ‘Overall Learners of the Year’ for HOSPA’s hospitality-focused Professional Development Programmes in Financial Management and Revenue Management were announced on Thursday 25th January 2018 at the Hilton on Park Lane, London. The two outstanding learners were presented with specially engraved glass trophies and complimentary day delegate spaces for HOSPACE2018, at the HOSPA Annual Learner Awards Ceremony – a stand-alone celebration, sponsored by MRK Associates and Corecruitment and dedicated to the achievements of HOSPA learners. Monica Hyde and David Clancy were both presented with a glass trophy and a complimentary delegate space at HOSPA’s prestigious annual HOSPACE2018 Conference and Exhibition, to be held on 1st November 2018 at the Royal Lancaster London Hotel. 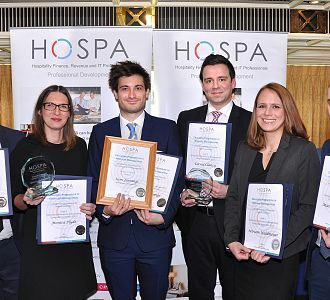 The awards were presented by Debra Adams, Head of Professional Development at HOSPA and Harry Murray, newly-elected President of HOSPA and Chairman of Lucknam Park Hotel & Spa. Monica and David were amongst twelve learners who each received certificates and prizes for achieving the highest combined course work and examination scores during their studies in Financial Management and Revenue Management with HOSPA on courses completed in February 2017 and August 2017. Wendy Carman, Director of Finance at Carden Park Hotel, said: “When we were looking for a Finance Learning Programme we knew instantly that HOSPA was the right fit for Carden Park Hotel. It is an industry recognised programme that not only ensures our employees are gaining the right qualifications and knowledge but one that #teamcarden are also enthusiastic about completing. Alan Corlett, Group Commercial Revenue Director for Principal Hotel Company, commented: “The Principal Hotel Company owns and operates over 30 landmark buildings across the length and breadth of the U.K, comprising of PRINCIPAL in city centres and De Vere, modern country estate hotels with mansion houses at their heart. A £250 million investment programme is currently underway, which will see many of the group’s properties refurbished and repositioned, including The Principal London, the former Hotel Russell, which will open in Bloomsbury this April following a £75 million restoration. Prior to the Awards Ceremony itself, the afternoon’s proceedings started with a Panel Debate, chaired by Professor Peter Jones MBE, Chairman of the HOSPA Professional Development Committee and involving expert participants: Martin Christian-Kent from People 1st, Hugo McNestry from Trothco Ltd, Harry Murray, President of HOSPA and Chairman of Lucknam Park Hotel and Ally Northfield, Head of the HOSPA Revenue Management Community and Director, Revenue by Design, discussing the education needs and recruitment of hospitality finance and revenue managers. HOSPA also welcomed sponsor Corecruitment for the first time. COREcruitment is a leading international recruitment consultancy with a friendly team of market specialists covering multiple markets across the service industry. Established in 2005 it has rapidly earned an enviable international reputation for its professionalism and high-quality service delivery founded on its three core principles; integrity, efficiency and transparency. The HOSPA Professional Development Programme in Financial Management is the entry route to Associate membership of HOSPA for finance personnel in the industry. The programme provides career development for hospitality accounting professionals wishing to gain additional skills and the knowledge required to manage hospitality finance divisions, or gain an understanding of the accounting function of a hospitality unit. The three-stage ‘blended learning’ programme, studied over three 5-month periods, provides the flexibility for accounts professionals to fit their learning around their busy working day. Successful completion will significantly enhance their careers and help their employers meet even more effectively today’s ever changing management challenges. The HOSPA Professional Development Programme in Revenue Management was developed by leading educators in revenue management in the hospitality sector, in conjunction with leading industry experts. The course is designed to provide aspiring and current revenue professionals with the skills and knowledge required to manage their divisions, as well as to provide non-revenue managers with a detailed knowledge of the function within a hospitality property. A grant from the Savoy Educational Trust has enabled HOSPA to update and reposition its current Revenue Management Programme and has allowed the individual units, within the online programme’s three levels, to be studied in a modular format. This, in turn, is making the course more flexible – providing greater accessibility to a wider audience. A further development to strengthen HOSPA’s commitment to this important function in the hospitality sector has been the release in November 2017 of the 2nd edition Revenue Management ebook which provides an invaluable introduction to the world of Revenue Management and how it can be used in the hospitality industry.